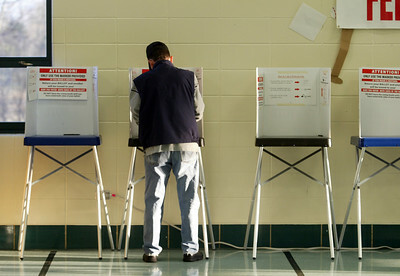 H. Rick Bamman -hbamman@nwherald.com Jerry Monica voted Tuesday morning at the Woods Creek School cafeteria in Crystal Lake. H. Rick Bamman -hbamman@nwherald.com Jerry Monica voted Tuesday morning at the Woods Creek School cafeteria in Crystal Lake. 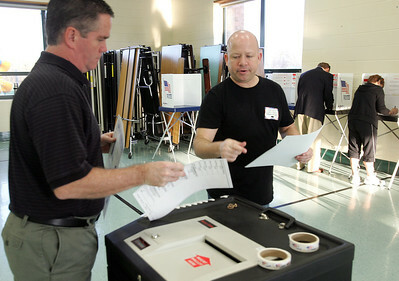 Election Judge John Spaw assists Jerry Monica as he casts his ballot. 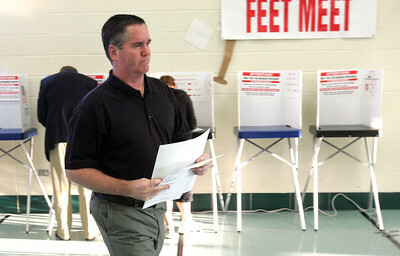 Election judge Ron Sloan searches for a voter's name. Grafton Township precincts 13 and 8. H. Rick Bamman -hbamman@nwherald.com Election Judge John Spaw (right) assists Jerry Monica as he casts his ballot Tuesday morning at the Woods Creek School cafeteria in Crystal Lake. H. Rick Bamman -hbamman@nwherald.com Election judge Ron Sloan searches for a voter's name at the Woods Creek School cafeteria in Crystal Lake. 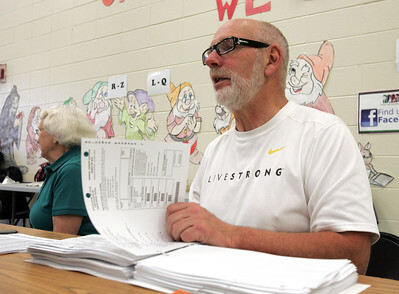 Election judge Ron Sloan searches for a voter's name at the Woods Creek School cafeteria in Crystal Lake.